“SPEARMAN, Tex. — Tight supplies of corn, soybeans and wheat have sent prices skyrocketing in the last year, prompting worries of a looming global food crisis. In other years, American farmers have responded to high prices by devoting more land to staple food crops. But this spring, many farmers in southern states will be planting cotton in ground where they used to grow corn, soybeans or wheat — spurred on by cotton prices that have soared as clothing makers clamor for more and poor harvests crimp supply. The result is an acreage war between rival commodities used to feed and clothe the world’s population. MONTPELIER — A Vermont farm advocacy group that was ordered to stop offering raw milk workshops will get to resume the classes under a bill proposed in the state Legislature. Garcon, just bring a whole jar of the good stuff and some glasses! 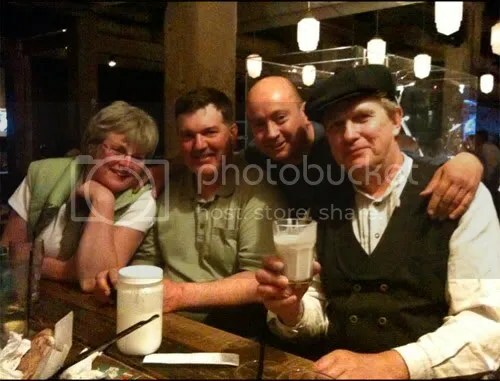 Michael Schmidt celebrates with friends after a successful day of "raw milking" at North America's premier natural health show.